It's so gray, it's hard to tell it's 10 in the morning. And we're surrounded by mist, as if a micro-sprinkler in the vegetable aisle were hanging overhead. In the trailer on Exchange Street, we gear up in hard hats, safety glasses, and bright orange vests before heading over to the barges parked on the Genesee River. The exaggerated size of everything is immediate and overwhelming: bolts as big as sledge hammers, cranes reaching several stories high, steel panels weighing50 to 60 tons rise and descend. This is the world of Iron Workers Local 33 of Rochester. Tim Elward, an iron worker for the last 24 years, is the foreman on one of the most visible Rochester projects in years: the Troup-Howell Bridge. 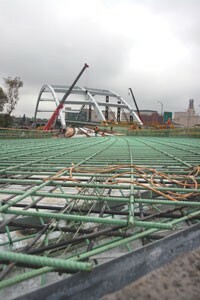 When it's completed sometime in 2006, it will be the widest triple-arch suspension bridge in the US. 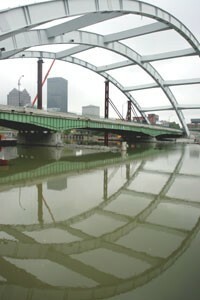 It will also become an icon, an image that will be identified with Rochester for much of this century. Though women have ventured into the field, iron work remains a world of high testosterone, mostly because of the physical strength required to do the job. It is extremely hard work and it can be dangerous, though you would never know it watching these guys straddling steel a couple of hundred feet in the air. And it's a gypsy's job. Iron workers sometimes travel more than a hundred miles to get to work, seeing their families only on weekends. Standing on a barge in the river, Elward described what it's like to be an iron worker on the Genesee project. I first got into this because my family was in it. My father was an iron worker. I have a brother, an uncle, and a couple of cousins who were iron workers. You learn by hands-on experience; that's the only way. Most people serve a three-year apprenticeship. It's really not as hard as it looks to understand how all of this comes together. 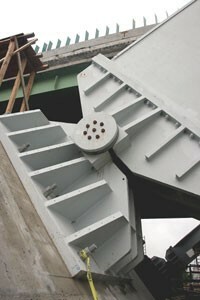 Everything is pre-engineered, and they tell us what crane to use, where this goes, where that goes. It's all done in advance, and a lot of it is assembled on the ground and then hoisted into place. But it takes weeks, sometimes months of prep work to get the job going to the point where you can actually see it being formed. That's one of those things we all like, when you get to that point where you can actually see things coming into place. The height isn't a problem. I'm not really bothered at all by height, and you probably wouldn't want to go into this if you are. No, it's really the traveling and the time you spend away from your family. I live south of Naples. And it's the pressure from all of this responsibility. You really have to know what you're doing, because it's so easy for somebody to get hurt if you're not careful. There haven't been any serious accidents on this job, but that's because we work at it every day. We've all had the accidents. It comes with the job. Right now I'm nursing a shoulder injury, and a while ago I strained my back. But we're very careful, and these guys are some of the best in the field. They know what they're doing. A lot of people think it's only a summer job, but we're here unless it is raining hard or there is too much ice and it gets too slippery. This past summer we had over 20 guys on the job, and we were working weekends, too. Right now, we're at around 10 guys. It's not for everyone. A lot of people drop out the first week on the job. We had a few young guys this summer, but one came in the morning and didn't come back that afternoon. Another one looked at this job and got really motivated to go back to school. Safety is the biggest thing that's changed on the job. When I started, you didn't have to be tied down. Today, with OSHA and everything, you have to be 100 percent tied down up there. Yeah, I would do it all over again. My wife worries about me, but it's good money. And from time to time, my kids will ask, Dad, did you work on that building? And usually I have. 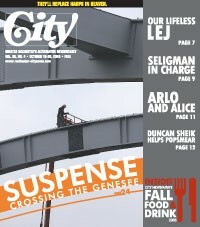 I've worked on a lot of these buildings --- the Bausch & Lomb building, Lincoln Tower, the Sibley's overpass to Midtown. I like that we have built something that people use every day. It serves a purpose.